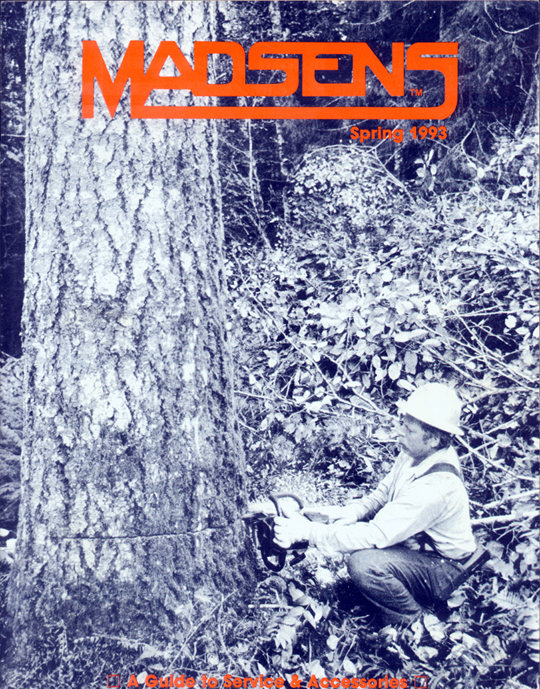 Madsen's first catalog was printed in 1986, our fortieth year in business. We had printed other advertising material before this, but this was our first effort at a catalog and first document to regularly feature a large image of a pro saw user. 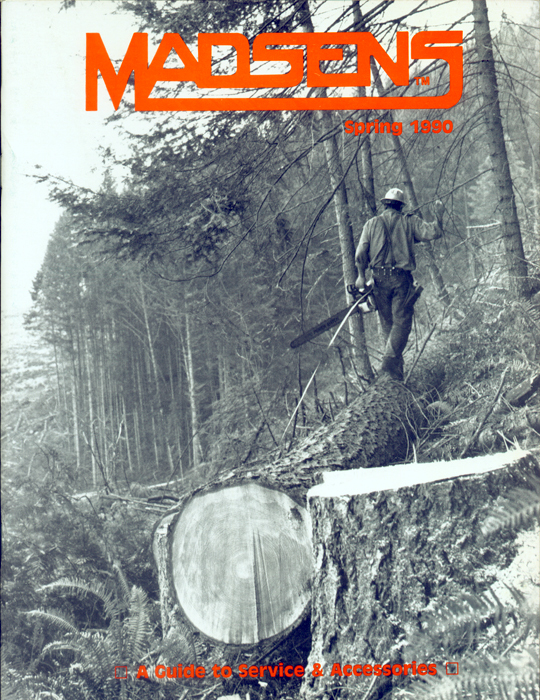 The first cover image was a stock photo from Logger's World Magazine. We don't have a record of who the timber faller was or where this photo was taken. We didn't have much photographic experience at that time nor knew much about producing a catalog cover. 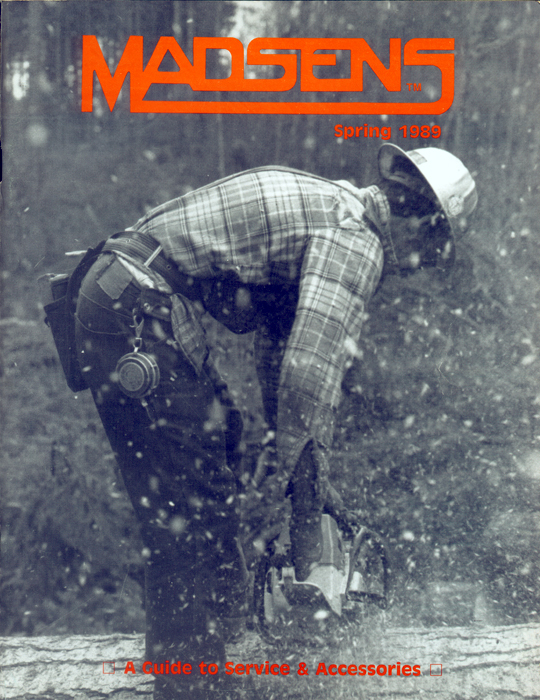 The photo on the cover of our 1987 catalog was of Dan Rogers, working on a strip near Curtis, Washington. In the photo, Dan was running a Husqvarna 181, a new model at the time. The photo was taken by Sam Madsen with a Nikon FE camera shooting Kodak Tri X film. 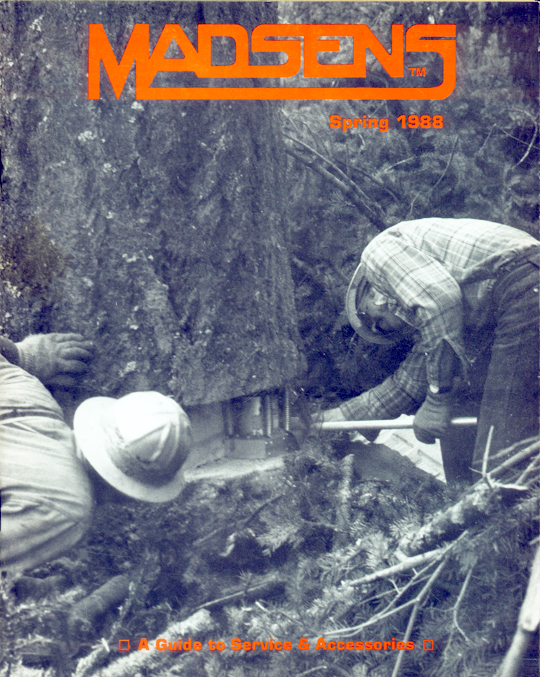 The 1988 cover photo featured Dan Rogers (left) again and Mel Studer (right), who was placing a new Silvey Featherweight Tree Jack. This type of tree jack was new to the market at this time. The photo was also taken by Sam Madsen with a Nikon FE camera. 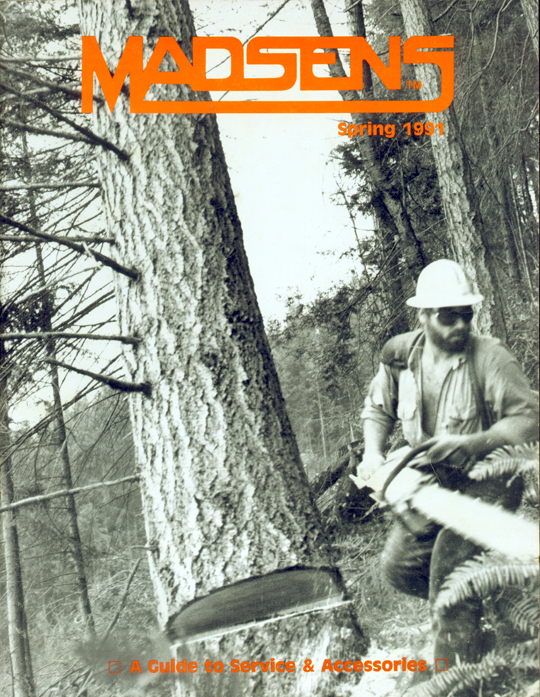 The 1989 cover photo is of Mel Studer making a bucking cut with a new Stihl 064. It was taken by Sam Madsen with a Nikon FE camera. 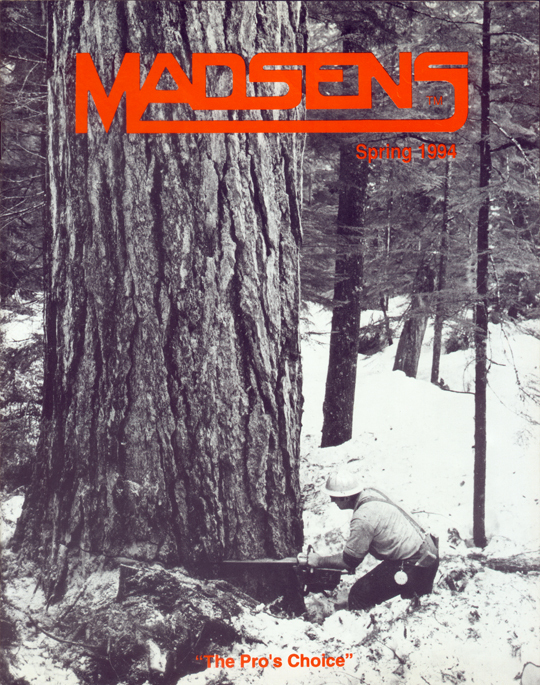 In 1990, the cover shot is of Bill Foister taping a log he just felled on a strip near Vail, Washington. The photo was taken with a Minolta X700 and Kodak Tri X film. The above image captures Bill Foister moving away from a tree he has just cut. We always like action shots and in this photo, a lot is happening. It was taken with a Minolta X700 camera shooting Kodak Tri X film. This is a photo of Steve Hunt falling a tree in a serene setting. It was taken by Sam Madsen with a Nikon FE camera. The 1993 cover photo is of Conrad Fagernes. In the years after this cover shot, Conrad went on to run a large cutting crew. The photo was taken by Ralph Madsen. 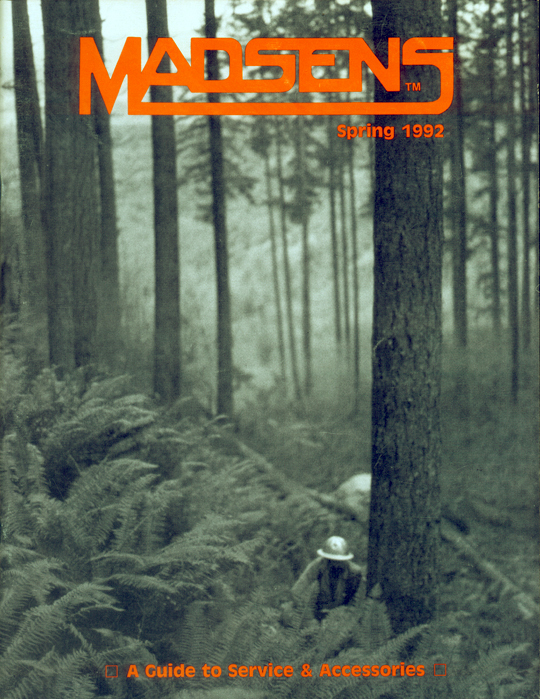 This photo, taken in 1971, was on the cover of our 1994 catalog. It was a tribute to Jack Pollman, who had recently passed away. 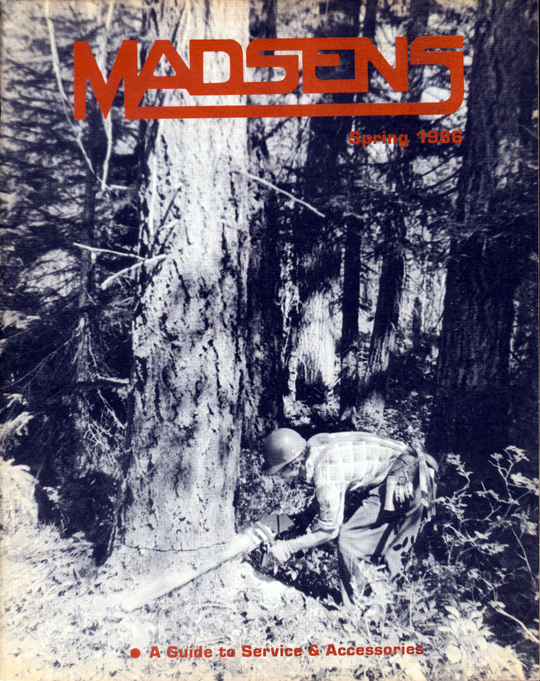 Inside the cover of the catalog, the credit read: "Pictured is Jack Pollman falling an eight-foot-diameter Douglas Fir. This was taken at Wobbly Creek on the Cispus near Randle, Washington. 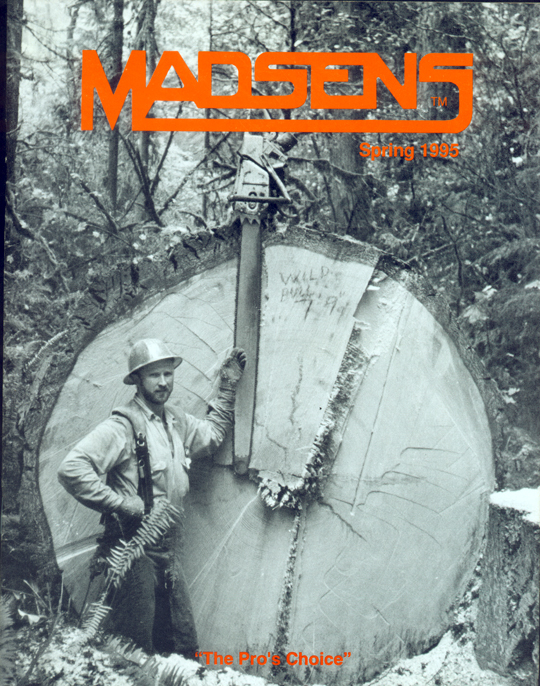 Jack fell timber like this for almost forty years and was one of Madsen's earliest pro customers. He was a 'big' man in stature and character. His size #15 calked boots weighed as much as a power-saw --- and his heart was just as big. Having him as a friend and customer was a real pleasure. Jack is gone now, but the memory of a truly great man lives with all who knew him." 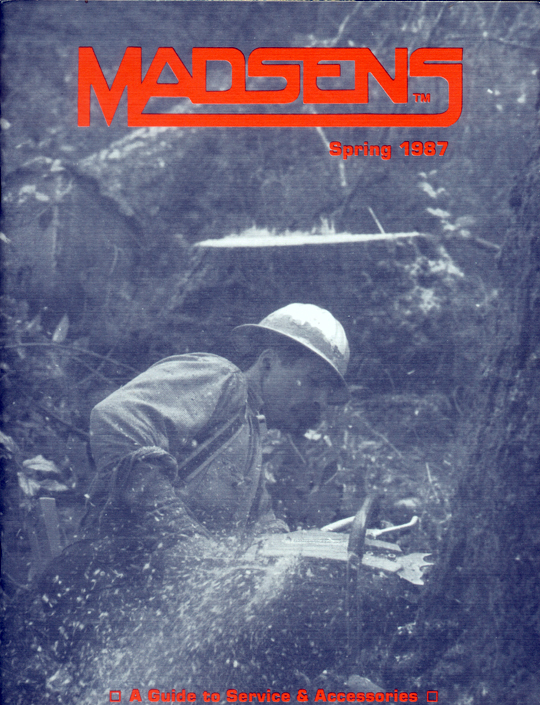 In 1995, our cover photo featured "Wild" Bill Davis of Davis Contract Cutting in Blodgett, Oregon. In the photo is a 7'9" fir Bill cut in 1994 on a BLM strip west of Eugene, Oregon. He fell it with a Stihl 084 fitted with a 50" Cannon bar and Oregon saw chain, also shown. He used a Silvey Tree Saver Jack he had purchased from Madsens to save out 30,000 board feet of good logs. The photo was sent in by him along with a note that read, "Just thought you'd like to see what the Silvey jacks I purchased recently are doing for me."